Jasvir Singh Banth, 32, sits surrounded by colourful containers labelled Army, Fighter, Super Fighter, Lethal, Malamaal, Spark, Axe, Arjun, or Rogorin. A small red triangle on the label signifies what the cans contain: poison. 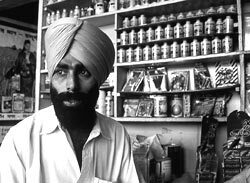 Banth's pesticide shop is the only one in a 7-8 kilometre radius. He started in 1995. He has a diploma in electrical engineering. But another diploma, attained via a correspondence course on agriculture, provided him intrinsic knowledge about the business. Customers throng the shop. "Last season, business was good. But this belt is the worst as far as sale of pesticides is concerned, compared to all of Punjab." He points to the containers. "We mostly sell 50 ml to one litre packs. In other districts, one litre is the minimum packing size. There, you talk of 10, 20 and 50 litre drums," he adds. Why is this so? "Small land holdings and the kind of crops grown here," he says. People here grow vegetables: "Therefore, pesticide use is nothing compared to the cotton belt and rest of Punjab." How does the business work? "Most farmers who initially come do not know much about what to use. They just tell us the problem, and we tell them what to use and how much," says Banth. "We systematically tell the farmers how to apply and in what quantity. If they spray less, it will have no affect and go waste. Certain pesticides, like cypermethrin, will dry up the plants if sprayed in greater quantities. So the farmer has to be careful. Others, like chlorpyrifos and endosulfan, have no adverse affect even if over-sprayed," says Banth. A farmer arrives. He wants something to kill termites. Banth hands over a 100 ml bottle of Chlorotox -- chlorpyrifos. The price: Rs 20. Banth assures him it will work. What sells in the area? How much? Banth reels off: "We sell chlorpyrifos, endosulfan, malathion, dimethoate, phorate, hydrocartap, cypermthrin, monocrotophos, avant and spark. Among herbicides, atrazine, isoproturon, metrivision, anilophos and butachlor sell the most. Last year, from my counter I sold 500 kg of atrazine; butachlor about 250-300 litres; anilophos about 400-500 litres; 300 litres of endsoulfan and about 500 litres of chlorpyrifos." How much does a farmer spend, on average, on pesticides? "This depends on the weather," Banth replies. "This time there hasn't been much of a pest attack on paddy; only about 2-5 per cent of the crop has been affected. But last year the pest attack was huge, and expenses ranged from Rs 1,500 to Rs 2,500 per acre just for paddy. The expenses for wheat and maize is only about Rs 400-500 per acre. Maximum expenses are on paddy and ladies' finger. Near the Sutlej riverbank [adjacent to the village], companies have huge ladies' finger plantations. Last year there was a huge stemborer attack there; imdiacloprid and avant were used quite a lot." Banth is gearing up for sales: the vegetable-growing season begins in November. Tomato, brinjal, bittergourd, gourd and other vegetables will be sown. "A large number of muslim migrants come from Uttar Pradesh to cultivate vegetables on the banks of numerous canals. They live there and sell their produce on the roadside. By March they return," Banth informs. They are big customers. And farmers in the area? "Actually the farmers want immediate results, as soon as the spray is over, within 2 hours. So they prefer contact incesticides. But their effect does not last long, only about six hours after spray. Systemic pesticides like endosulfan show effect only the day after being sprayed. They stick to the leaves and stem, an insect comes to eat and dies. They stay on crops much longer," he says. Shop apart, Banth owns four acres of land on which he grows wheat and maize. He is also planning to set up a vermicomposting unit. "There is an increasing demand for organic manure. I can set up a vermicomost pit on a piece of land I own near the [river] Sutlej." He is currently researching on the nitty-gritties involved.